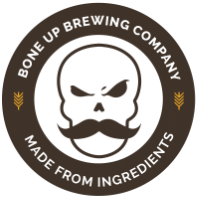 Stats: Chance - Bone Up Brewing Co.
Color: Obsidian, with flashes of onyx at the edges. Food Pairing: A heapin' helpin' of blue crabs covered in Old Bay. Music Pairing (Jared's Choice): "Yakety Sax" by Boots Randolph or "Flight of the Bumblebee". Best Occasion to Drink: While strolling the beach late at night. Brewer's Notes: The first in our series of beers made to commemorate puppers past, this beer was brewed to honor the memory of Chance - an energetic and wiggly* lil' scottie who brightened our lives until late last year. So obviously we had to brew a beer that was small, dark, and sweet; then we tossed in some chipotles and black peppercorns to give it a spicy little zip. Enjoy!